The trend for futures declines on Sunday evening is still intact. The S&P futures down 9 points and the same as last Sunday, actually Monday night because of the holiday. There are no headlines and the Asian markets are slightly positive ahead of the Chinese trade talks in Washington at the end of the week. The Chinese delegation will be led by Vice Premier Liu He and a cast of dozens. With the talks at a high level there are hopes something will be accomplished. We have a really good chance of some initial gains since China floated the proposed purchase of $1 trillion in additional goods over the next six years. The worst case scenario for a successful meeting is some kind of trade agreement on goods that convinces the administration to extend the March 2st tariff escalation deadline out for another 90 days while negotiations continue. The worst case for an unsuccessful meeting is that the president begins to talk up the threat of tariffs jumping from 10% to 25% on March 1st. That threat is always in the background but it has not been discussed much in recent weeks. The administration is trying to negotiate calmly but from a position of strength. Treasury Secretary Mnuchin said last week that the two countries were "making a lot of progress" in trade talks and he looked forward to working with China's Lis this week. Shortly after Mnuchin's comments, Commerse Secretary Wilbur Ross said the US was still "miles and miles" from reaching a trade deal with China. Mnuchin's comments lifted the market and the Ross comments tanked the market. Complicating the talks is the US request to extradite the Huawei CFO from Canada to the US where she could stand trial for fraud and breaking sanctions. The Trump administration is trying to get America's allies to bar Huawei and other Chinese tech firms from building the infrastructure for global 5G network. Chinese products have been found to have backdoors build into them to allow China to eavesdrop on communications. China has proposed to several countries that they would give them the 5G infrastructure to build out their countries at no cost because we want to help the global community. Why would China spend billions to build out the communications network in South Africa for free? There is obviously a hidden reason. This will complicate any trade discussions with China. 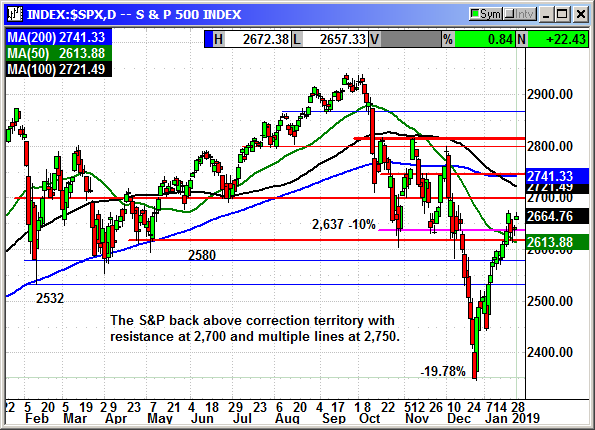 The S&P had rallied for four weeks before stumbling at the 10% correction level of 2,637. After consolidating for a week, Friday was a breath of fresh air and it almost made it to a new 5-week high. There were just enough big cap losers to keep that from happening, but we should be thankful for Friday's gain. We are heading into big cap tech earnings and there is likely to be volatility with some missing estimates. Resting nearly 30 points above support gives us some room if Apple and/or others stink up the place. Support is back around 2,615 with some congestion just above that level. This is where we should begin to worry if downside volatility reappears. The Dow was helped by the tariff sensitive stocks like Boeing, Caterpillar and 3M but Apple was surging ahead once again. While a 5-point gain was remarkable ahead of earnings the stock is still very oversold, and this was probably a combination of short covering and bottom fishing ahead of Tuesday's event. 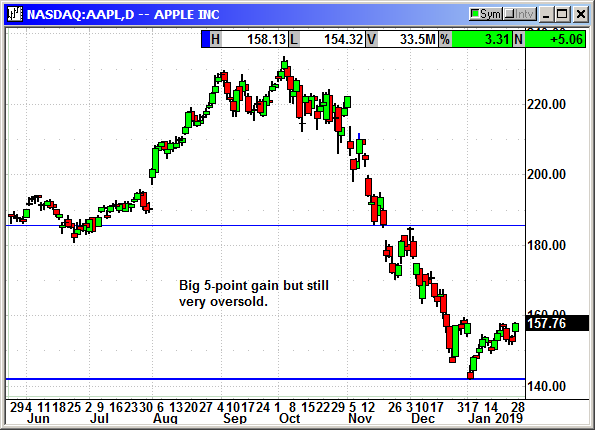 The odds are good we are going to see a major move in Apple, only the direction is unknown. 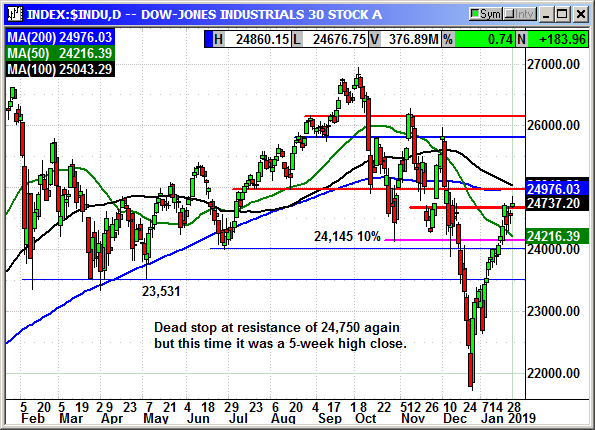 The Dow overcame its consolidation early in the week and closed right at resistance at 24,750. If it can move over that level the round number resistance at 25,000, which is also the 100 and 200 day averages, will be the next hurdle. There are 13 Dow components reporting earnings this week. There will be volatility. 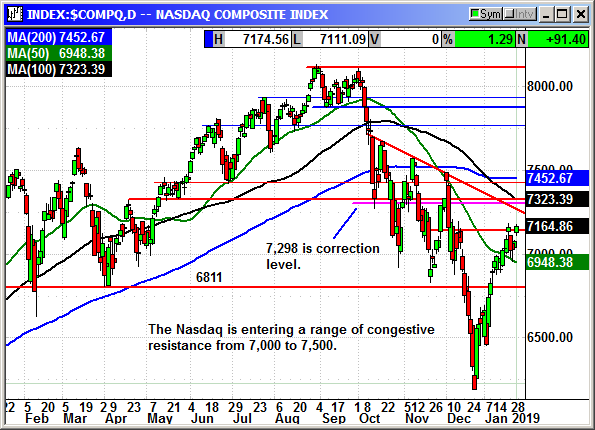 The Nasdaq closed at a 7-week high and just over resistance at 7135-7157. The Nasdaq is approaching a very active period of congestive resistance between Friday's close and 7,500. This should not be a walk in the park but a tough uphill battle. The flurry of big cap tech earnings next week will provide volatility in both directions. Support is now around 7,000. 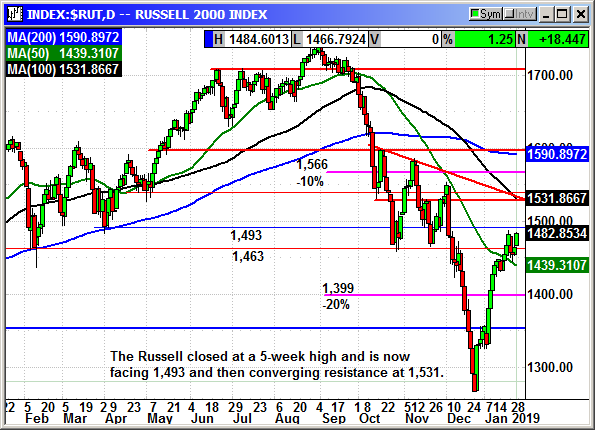 The Russell recovered from the early week decline to close fractionally positive for the week and at a 5-week high. There is a little white space on the chart before there are multiple lines of converging resistance at 1,531. 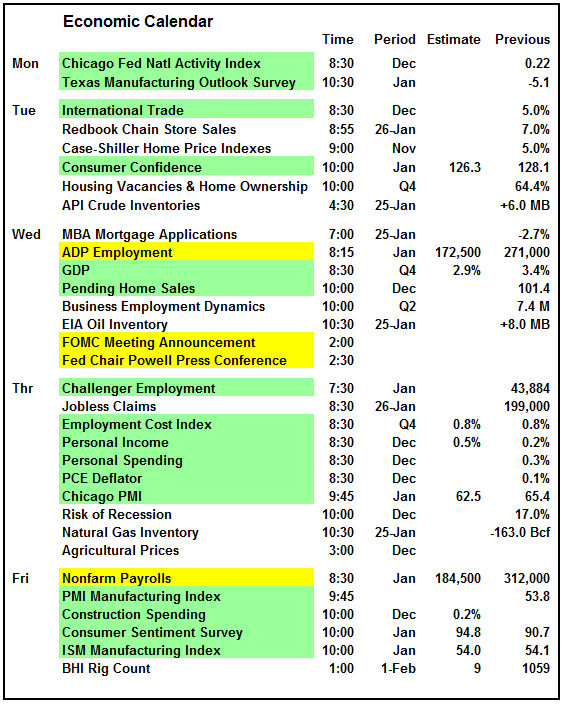 The economic headline event for next week is of course the FOMC decision on Wednesday and the Powell press conference. There was some "messaging" last week about a potential slowdown in QT if the data supported it. This is another change in the posture for the Fed suggesting they got the message from the market. With Mario Draghi warning about a continued slowdown in Europe and the potential for a hard Brexit, there may have been some communication between the central bankers and Powell is being preemptive in his messaging. This is also payroll week. I do not know if the government shutdown with 800,000 people furloughed will have any impact on the Nonfarm Payroll numbers or not because I don't know how they account for that in their surveys. The ADP number should not be impacted because that does not have any government component. It is corporate payrolls only. There are a lot of reports because some were postponed by the shutdown and pushed into next week. There may be some I do not have on the schedule because the new dates have not yet been assigned for those previously postponed. The earnings calendar will be far more important than the economic calendar. For this reporting cycle 112 S&P companies have reported Q4 earnings with average growth of 14.3% and 5.6% revenue growth. More than 72% of companies have beaten on earnings and 58% have beaten on revenue. More than 125 S&P companies report next week. There are 13 Dow components reporting. The most important part of this cycle is the rapidly declining estimates for Q1. Estimates were over 8% as of December 1st and that has fallen to only 2.0% as of Friday. If the Q1 forecast falls below zero, the market is going to react negatively. Guidance will be especially critical this quarter. Q2-2019 estimates have fallen from 10.6% back on July 1st to a forecast for 4.5% today. Q3-2019 has declined from 12.1% on October 1st to 3.4% today. This is going to be a hectic week. 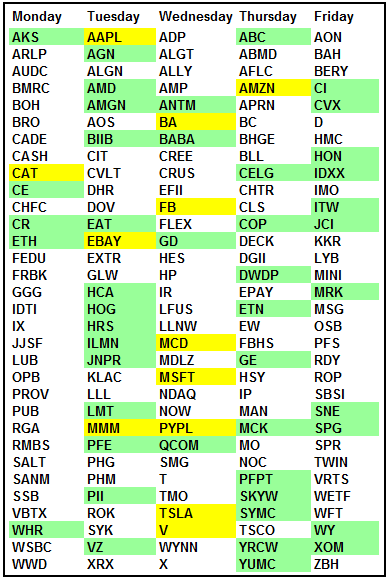 With 13 Dow components, 125 S&P components and most of the Nasdaq big cap tech stocks reporting earnings along with a FOMC decision there will be plenty of headlines. As usual, guidance will be critical in maintaining the rally. Companies will be required to beat on both top and bottom and raise guidance. Anything else will result in declines. The Tuesday before a FOMC decision is normally positive. With the government shutdown over temporarily and China coming to talk at the end of the week, the political headlines should be positive. Obviously, we all know the market does not need a reason to sell off. However, recently it has been climbing the wall of worry on a regular basis. Let's hope this continues.